The inspection of minute components with different surface features imposes stringent requirements on the test method employed. An inspection system built by machine manufacturer Zorn Maschinenbau demonstrates that errors with the integrated Trevista imaging system can be detected reliably and evaluated to a professional standard, even on complex objects: By cutting the incidence of 'pseudo scrap' to below two percent, this 3D technology is vastly superior to conventional vision solutions. 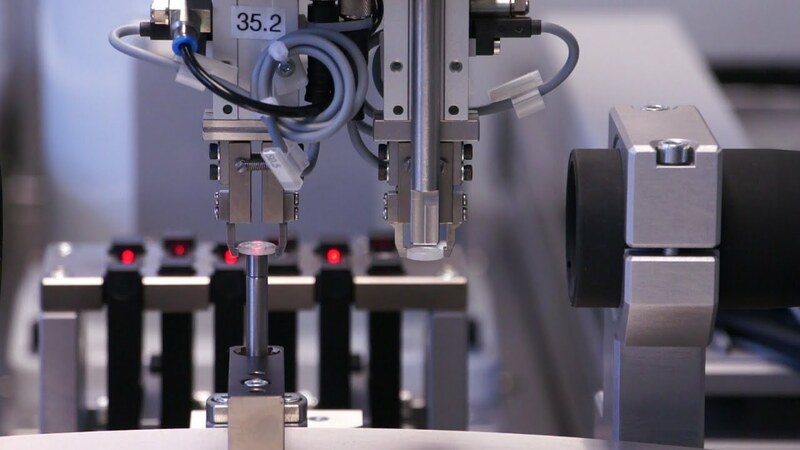 Numerous automation and machine vision systems are integrated in Zorn’s inspection system to check shiny metal parts for fuel injection pumps used in the automotive industry. The Trevista imaging system (with a Teledyne DALSA camera) operates with the patented Shape-from-Shading process that determines the three-dimensional form of an object from its distribution of brightness and surface shading. Precise image aquisition thanks to the AVT Manta camera and Opto Engineering’s telecentric lens. Xactools user interface simplifies the handling of the system. Thomas Erb from Xactools (on the left) and Zorn CEO Martin Zeiher examine the system‘s user interface. Multi-dimensional imaging is one of the most powerful instruments in the field of automated quality assurance. However, to a growing extent, complex object geometries and varying material properties are imposing limits on conventional optical test methods. For example, if the surface structure of a test specimen is irregular or if its reflection features fluctuate widely, it is often not possible to detect and evaluate errors reliably. That factor can increase the risk of defects while also increasing the proportion of pseudo scrap arising at the quality inspection stage. For the manufacturer, this imposes the need for additional manual checks further downstream in the process, causing costs to rise, and all of this can be avoided through the use of optimised systems. More advanced vision systems operate quickly, precisely and objectively. On the basis of their optimised technologies, they deliver accurate information irrespective of the surface properties of the test object - even at high rates of inspection throughput and with short cycle times. Zorn Maschinenbau GmbH, based in Stockach beside Lake Constance is one of the companies to be using a system of this kind with Trevista. In collaboration with the imaging experts from STEMMER IMAGING and with system integrator Xactools, the manufacturer of assembly, production and inspection systems has succeeded in integrating 3D technology in an automatic test unit for small carbide metal components. The inspection system built by Zorn is used to check small and very small components that go on to be used in the production of fuel injection pumps in the automotive industry. Stringent requirements are therefore placed upon the imaging analysis process: "Depending on the nature of the previous machining operation, test pieces can have vastly differing surface features", explained Jörg Schmitz from STEMMER IMAGING. "Furthermore, the level of reflection has an important role to play, in particular on metallic materials. Strong contrasts between bright and dark or matt areas frequently prevent us from making definitive statements about the actual surface quality." A powerful imaging system must therefore be able to eliminate the surface texture of a test object and focus solely on rendering its topology visible. "In this way, critical defect areas in material can be distinguished clearly from non-problematic variations in brightness, or from simple impurities", continued Schmitz. An intelligent approach to a solution is provided by the Trevista imaging system available at STEMMER IMAGING as complete system including lens, camera, software and PC. It operates with the patented Shape-from-Shading process that determines the three-dimensional form of an object from its distribution of brightness and surface shading. The central component of this system is its specially developed LED dome lighting: specifically, its function involves illuminating a dome-shaped lens from four different directions in turn in a structured manner, while at the same time taking a camera image. The resultant incoming images are processed by a computational algorithm into four synthetic result views. Two direction-dependent inclined images depict the surface inclination in x-direction as well as in y-direction; they are especially well suited to the localisation of defects with a defined preferential direction. In addition, the curvature image reflects the surface topography independently of direction, meaning that precise information about the position and size of a component defect can be extrapolated. The fourth result image comprises a purely textural view, roughly approximating a sheen-free 2D image that can be used to detect areas that are simply surface discolourations. The imagery data record created in this way is transferred to the imaging system where it is evaluated automatically. The algorithm-based computations are performed by the software platforms Sherlock from Teledyne DALSA and Common Vision Blox (CVB) from STEMMER IMAGING. The imaging software is activated by a user-friendly Xactools user interface: "For us, this makes it possible to integrate complex technology unproblematically in the existing system context", explained Martin Zeiher, CEO of Zorn Maschinenbau GmbH. Two of his recently constructed inspection systems use Trevista imaging technology; this involves the use of a total of six such systems. "The inspection results soon convinced us of the effectiveness of 3D imaging. On the basis of the relief images, form features can be detected to high levels of precision, even on curved, reflective or high-sheen surfaces. As a result, the incidence of errors drops yet further and we significantly reduce the proportion of pseudo scrap." A view shared by Thomas Erb, CEO of Xactools: "With a conventional optical inspection, we generally assume a pseudo scrap rate of around ten percent. Practical inspection experience demonstrates that this proportion can be cut to below two percent with the Trevista method". According to Erb, the system operates quickly and effectively. "The manufacturing industry is a case in point, seeing this as an effective instrument for further improving the efficiency of their quality testing." At present, 3D technology is embracing new areas of potential in virtually all fields of application associated with the automated inspection of objects. At the same time, modern quality assurance is moving away from the long-upheld paradigm of zero error tolerance: To a growing extent, there is now a move away from detecting as many defects as possible, even on the tiniest scale. The key focus is now on distinguishing between critical and non-critical defects, and on the reliable detection of anomalies that genuinely have an adverse impact on functionality. This makes it possible to keep volumes of scrap at a low level by adapting the tolerance limit within the system at which non-compliant components get rejected to suit specific requirements, while at the same time not defining that limit too restrictively. "The manufacturer's specialist expertise and experience-based knowledge have a big role to play here", explained Jörg Schmitz from STEMMER IMAGING. "Along the road to the optimum system solution, we can modify a multiplicity of variables and can test the impact of these under laboratory conditions. Nonetheless, the expertise of the user remains the decisive factor in the long-term success of operation of a given system." "Particularly in the specialist mechanical engineering sector, many companies often possess many decades of production experience", confirmed Zorn CEO Martin Zeiher. Nonetheless, in many cases, automated test methods have not been taken on board. System specialists are currently working on a Trevista variant with 4k resolution. “The cameras for such a system already exist. However, they need to be set up accordingly”, described Jörg Schmitz the next generation of Trevista vision systems. Martin Zeiher perceives promising application opportunities for these advanced Trevista variants: "Technological progress will continue to set new standards in the automation of quality assurance and will therefore, last but not least, drive the competitiveness of companies forward decisively in their international markets." Thomas Erb, CEO of Xactools(on the left) and Jörg Schmitz from STEMMER IMAGING discuss two stations of the system.